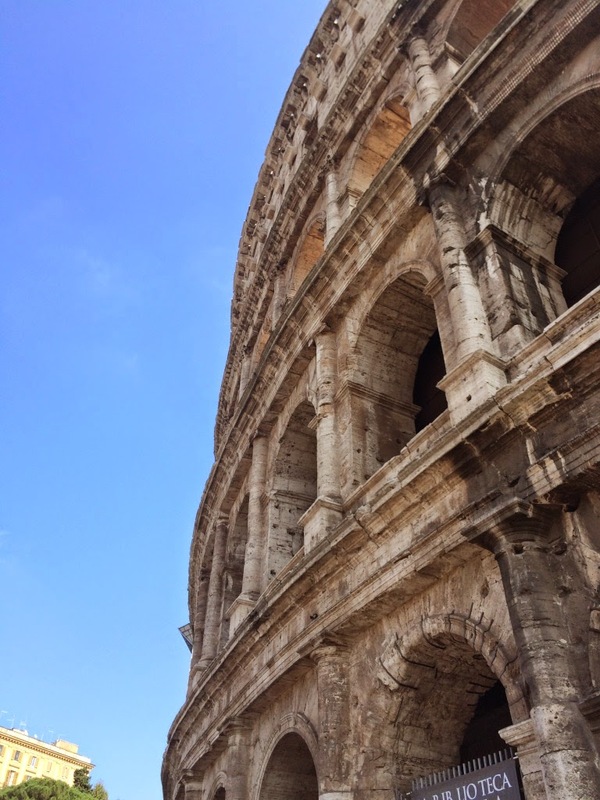 Our first “excursion” of the cruise was to Rome and it was jam-packed with amazing sites! 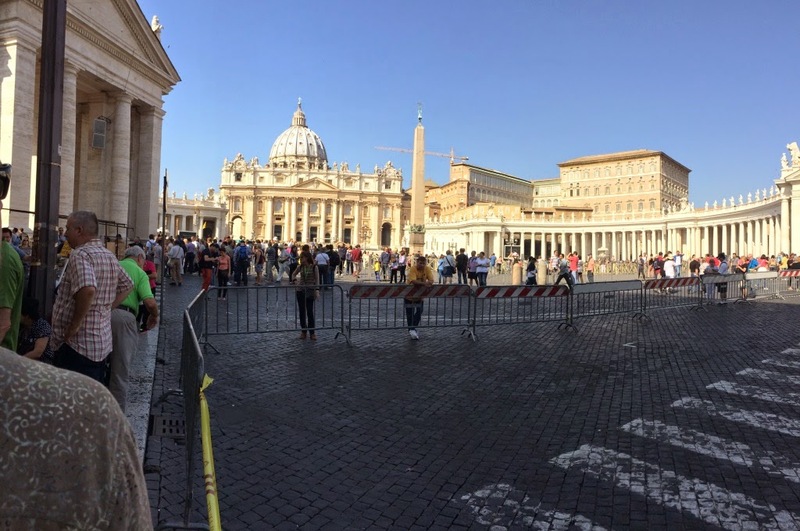 Our first stop (after a 90 minute drive) was The Vatican. I did not realize these 44 acres are a country unto themselves with the Pope serving as king. Speaking of the Pope, he was going to be giving a mass that day so we were anxious to see all it had to offer before everything shut down. The Vatican Museum was very impressive, but what I came to see was the Sistine Chapel painted by Michelangelo. This chapel is the Pope’s personal chapel and he does not have to share it with the rest of the world. We were instructed that no talking and no pictures were allowed inside, so I cannot share with you the visual of this spectacular masterpiece, but I can say it was overwhelming. 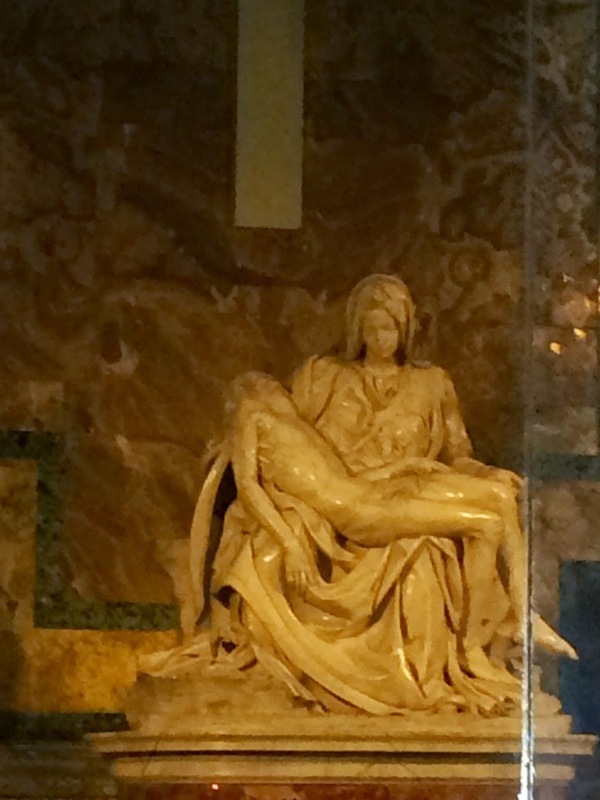 I can share Michelangelo’s Pieta which is in St. Peter’s church which is huge! The Pieta is now behind glass because a mentally unstable person took a sledge hammer to it years ago, but it is still impressive. Mary’s young face, which always confused me, was finally explained. It is said that Michelangelo wanted to capture the eternal youth and beauty of Christ’s mother. The rest of the church was breath-taking in it’s own right. Everywhere I turned were giant paintings, except they weren’t paintings. They were mosaics! Truly amazing! After this stimulating visual, we took a short tour of Rome before stopping for a real Italian lunch complete with pasta, veal and Tiramisu (I had two helpings of the last :-). Then we were off to the Colosseum. Wow. I said this word a lot on this trip. To be standing inside such a complicated work of architecture built in 10 years from 70AD-80AD and to know what went on inside was profound. The Colosseum originally had statues in ever outer archway, a covered roof, and three tiers of spectators. We were able to see where the animals were kept for fights and a partial floor had been rebuilt to give us an idea of how it may have looked over 2,000 years ago. Aristocrats and the emperor provided “shows” when they wanted to spend the money as the entire operation was very costly and it was free to the public. 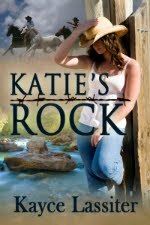 This was a great introduction to Rome and start to the cruise. I couldn’t wait to continue. Once back on board it was time to go to dinner, see a show, and stop in one of the on-board venues for dancing and drinks. But it was another early night because once again we had an early start the next morning for our excursion on the Amalfi Coast of Italy.